The Hill: Did TSA Use My Opeds for Their Wacky Terrorist Profiles? Americans love to grouse about the Transportation Security Agency. I have caterwauled as loudly as anyone over the years. But I learned last week that some of TSA’s absurdities might be my fault. TSA is proud of its 2600 Behavior Detection Officers (BDOs) who lurk in airports surveilling how travelers swallow, sweat, and blink. The Government Accountability Office walloped the program last week in a report on the official TSA “indicators” of terrorist intent that BDOs ferret out. GAO concluded that 98 percent of the studies TSA invoked failed to provide “valid evidence” to support TSA’s claims. Even more stunning, almost 80 percent of the “sources” TSA invoked were “news or opinion pieces,” all of which GAO dismissed as invalid. TSA refuses to disclose the list of those articles it offered to GAO so I don’t know if any of my pieces were used to justify its standards. In a 2004 New York Times oped, I lamented that TSA agents were looting checked baggage. More than 500 TSA employees have since been fired for stealing travelers’ property. Two years ago, I pointed out in USA Today that dozens of TSA behavior detection agents in Boston complained about the use of nitwit terrorist profiles such as black guys wearing baseball caps backward or Hispanics traveling to Miami. At the Newark airport, TSA behavior detection officers fabricated false charges against illegal aliens to boost the program’s arrest numbers. After TSA’s secret list of terrorist traveler traits leaked out, I mocked the BDOs targeting people who were yawning, hand wringing, and gazing down. My favorite TSA warning sign was “excessive complaints about the screening process” — which explains why TSA agents often treat me like an al Qaeda operative. No wonder TSA chief John Pistole denounced me for disparaging and maligning TSA employees. TSA was undaunted by GAO’s drubbing. The agency vindicated itself by trumpeting how BDOs watch out for “unusual exposed wires or electrical switches on a person” seeking to board a plane. But do we need a special TSA program to recognize would-be terrorists who received all their “training” from Road Runner cartoons featuring Wile E. Coyote assembling an Acme Bomb Kit? TSA could not provide a single example of its elite corps thwarting a threat to civil aviation. However, TSA proudly cited one case “where TSA’s behavior detection activities led to the identification of an individual attempting to conceal illegal drugs at an airport screening checkpoint.” Since this particular program has cost more than a billion since 2007, this could be the most expensive drug seizure in U.S. history. Since TSA was created in 2002, Americans have perennially been assured that the agency is smarter than it looks. Last week’s GAO report is a reminder that there is often nothing behind the curtain of harebrained policies except for bogus claims and hackneyed oped pieces. Regardless, I will be more careful about what I write about the agency. 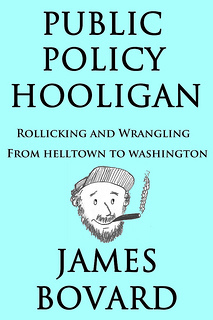 James Bovard, author of “Public Policy Hooligan,” is a member of USA TODAY’s board of contributors. Follow him on Twitter @JimBovard. One Response to The Hill: Did TSA Use My Opeds for Their Wacky Terrorist Profiles? I’m envious! You’re obviously doing something right if one of the government’s Big Thugs whines about you. Keep up the great work!